Only one will survive play over the next two weeks in Class 2A’s most talent-rich section, featuring consensus top teams Blake and Edina along with No. 6-ranked Wayzata. At least two other sections have some intrigue as well. No impassioned speeches. No papers thrown in frustration. No collusion. Despite — or perhaps because of — their daunting Class 2A, Section 6 placement, girls’ hockey coaches enjoyed a drama-free seeding meeting Sunday. There’s simply no way to avoid at least two different games in the most challenging postseason path to the state tournament. The top three seeds in Section 6 are No. 1 Blake, in its second season of opting-up to Class 2A after winning seven 1A state titles, No. 2 Edina, winners of the past two 2A state championships and No. 6 Wayzata, a rising Lake Conference power. Quarterfinals begin Saturday at Parade Stadium in Minneapolis. Both the semifinals on Feb. 13 and the final two nights later will be games worthy of a state tournament setting, Wayzata coach Jessica Christopherson said. Blake held the edge as section favorite since a 2-1 victory Jan. 18 at Edina. The Bears’ top line of Addie Burton, Izzy Daniel and Lily Delianedis presents opponents with the difficult task of slowing three equally dynamic players. Each has surpassed the 20-goal mark while their team has played a tough schedule. The trio joined forces in the fifth game of the season and remained intact other than portions of a few games where Reid tinkered with personnel. Defender Madeline Wethington, who has committed to the Gophers, is Blake’s top player. She logs about 25 minutes per game and makes a difference on every shift. 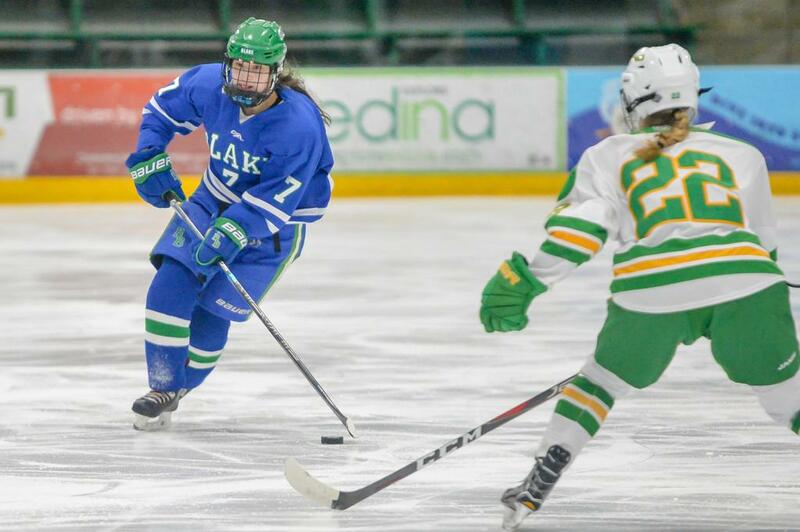 Like Daniel and Wethington, Edina forward CC Bowlby and defender Mallory Uihlein are Ms. Hockey semifinalists. The Hornets’ senior duo leads a talented collection of younger players hungry to stay on a championship roll. Ninth-grader defender Vivian Jungels and sophomore forward Hannah Chorske added a combined 19 goals and 29 assists. And junior forward Katie Davis, who transferred from Idaho, has great speed and skill to go with 22 goals. Davis and Bowlby are also competitors with an edge to their game. Reber said getting the No. 2 seed in the section after two consecutive years as the top seed has all of her players a little salty. The Hornets defeated the Bears 4-3 in the second game of the season. For Wayzata, success this season began with last season’s section semifinal loss against Blake. Down 2-0 in the third period, the Trojans tied the game with goals scored just 31 seconds apart. Then the young team faltered as Blake reasserted itself with two goals in the final four minutes. “We thought we were going to win and then Blake scored the go-ahead goal on a faceoff play we had practiced to stop quite a bit,” Christopherson said. Sophomore Gretchen Branton and ninth-grader Sloane Matthews are the Trojans’ youthful scoring leaders. Christopherson said both forwards have grown into more complete players, personifying a team on the cusp. “I think last year we overachieved a little and now we’re a veteran team who expects to be successful,” she said. A pair of top-10 metro area teams seem headed for a Class 2A, Section 7 championship game rematch. And two top-10 teams from northern Minnesota give Section 8 some punch, too. A year ago, Andover blanked Forest Lake for the right to represent Section 7 at the state tournament. 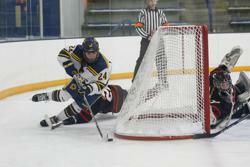 The Rangers got on the right side of an Andover shutout in December with a 1-0 victory. Forest Lake entered the week ranked No. 3, one spot ahead of Andover, and earned the top seed in Section 7. The teams are a study in contrasts. Andover’s top line of Peyton Hemp, Gabby Krause and Jamie Nelson set the pace. Defense is Forest Lake’s strength with Rachel Golnitz, Ellen Nelson and Elizabeth Valley. Both teams’ top goaltender stands out as well. Andover’s Cassidy Stumo should have been a Senior Goalie of the Year semifinalist while Forest Lake junior Allyn Goehner has shined in her first year as a full-time starter. Not since 2008 has the Section 8 representative advanced to the state tournament semifinals. No. 7 Brainerd/Little Falls or No. 8 Roseau hope to end the streak. The Warriors have defeated Roseau twice this season and are the defending section champions. And they have beaten No. 9 Maple Grove and lost to No. 5 Eden Prairie. Roseau’s resume features the Eden Prairie Invitational tournament championship. The Rams defeated Chaska/Chanhassen, Minnetonka and the host Eagles in late December.